High energy nutritional supplement for dogs and cats. Includes vitamins, minerals and trace elements. 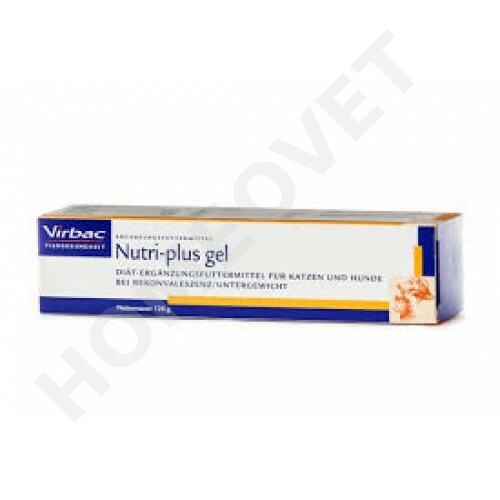 Virbac Nutri - Gel Plus is especially recommended for rapid growing young animals, hunting and working dogs pregnant and lactating females, maintenance of healthy skin and coat, or recovery following illness and surgery. Soybean oil, molasses, cod liver oil, meat extract, mineral premix, vitamin premix. NUTRI-PLUS GEL can be administered directly into the mouth or mixed into the feed. NUTRI-PLUS GEL should be given 1 to 2 teaspoons * per 5 kg (or 10 cm of gel) bodyweight per day. If NUTRI-PLUS GEL is the feed replacement, give 2 to 4 teaspoons * per 5 kg bodyweight per day.